"Was nichts kostet, ist nichts wert" goes a German saying; whatever is free can't be worth anything. 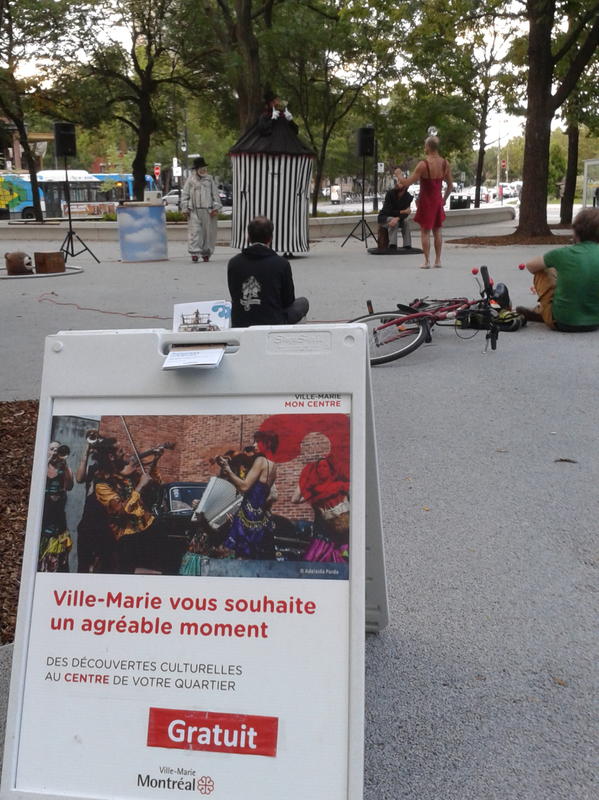 Montréal is challenging this saying every summer, with its countless festivals abounding in free performances of all kinds. But the complimentary entertainment is not limited to the Quartier des Spéctactles, as I found out on a recent summer evening. I had just gotten off the Bixi I rode home from work, and returned it to the station on the square close to where I live. As I did, I heard a swing band playing. Turning around, I spotted a small stage on the square, featuring a few musicians and a surprising number of locals dancing to the tunes. The town square harbors a little park, complete with a statue and a small pavillion. For at least as long as I am a resident of the area, it also hosted a semi-permanent population of homeless people. And while they were never really aggressive, they were often drunk and their jeers and begging did not invite one to linger. That changed this spring, when the square reopened after a major revamp. The city has invested in enlarging it, rearranging the surrounding bus traffic, adding new pavements and benches, upgrading the lights to colorful LEDs, and opening a seasonal coffee shop in the rotunda. They even threw in free WiFi. Crucially, they also worked with the police and the charitable arm of the YMCA to find a better home for the itinérants. Overall, it was a job surprisingly well done. But how about that dancing? That's where Montréal's charm comes into play. In early summer, I found a booklet in my mailbox that detailed a jam-packed 3 month program of events celebrating the revitalization of the square. From open-air cinema to puppeteering, from magicians to tai-chi and from gardening classes to yes, dance nights, the city offered an abundance of free activities all summer long. I smiled as I watched my neighbors swing the evening away. 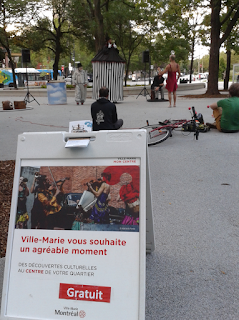 This was one of these frequently conjured up moments defining Montréal's joie de vivre. All these activities were offered by the city as a matter of course, and welcomed by the residents in much the same way. It is hard to imagine an equally lavish schedule of performances taking place on a similar occasion in another city. Judging by the many happy faces, and the alternatives, it seemed like a good investment. For of course, the German saying still holds true: The Sultans of Swing did not play for free. While the residents shook a leg, their tax dollars were hard at work.